Martin Truex Jr. celebrates his seventh win of 2017 at Kansas Speedway on Oct. 22, 2017 (photo courtesy of Getty Images for NASCAR). Sunday’s Hollywood Casino 400 at Kansas Speedway near Kansas City was the elimination race of round two of the 2017 Monster Energy NASCAR Cup Series playoffs, so at the checkered flag, the playoff field was whittled from 12 down to eight drivers. Drivers eliminated include Kyle Larson, Matt Kenseth, Ricky Stenhouse Jr. and Jamie McMurray. Several playoff drivers struggled at Kansas, including some of the drivers. Even race winner Martin Truex Jr. had his problems, courtesy of a restart penalty and an unscheduled pit stop for a loose wheel. Kenseth and McMurray were part of a crash on lap 197 that began with an Erik Jones spins and collected more than a dozen cars. Things went from bad to worse for Kenseth when he was parked by NASCAR for the rest of the race, because his team had one too many people working on the car while it was on the five-minute crash-repair clock. Stenhouse struggled throughout the race before contact with the wall put an end to his misery with just under 100 laps remaining. Larson, one of the leading drivers throughout the season, saw his 2017 championship hopes come to and end when he experienced the first blown engine of his Cup Series career on lap 77 Sunday. “You look at the past playoffs and the No. 78 (Truex) had an engine issue last year, and he was the best car all year, and then us, this year, so it’s disappointing,” Larson said. 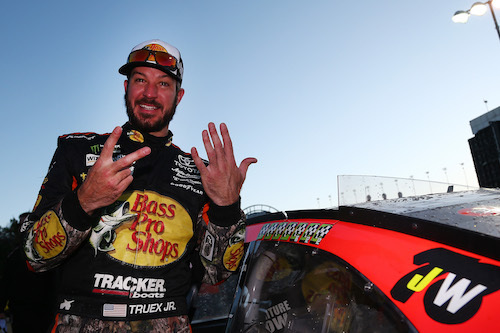 Meanwhile, with the latest win, his seventh of the season and third of the playoffs, Truex added another five points to his playoff-points tally to take into the third round that will begin at Martinsville (Va.) Speedway on Oct. 29.